It’s natural that most service members spend their vacation in the United States — it’s easier, cheaper, and soldiers just back from an overseas tour are not that keen on heading abroad again. There are many decent domestic military hotels offering very attractive rates, often half of what you can find on the regular market. Then there are a few properties that seem to be known by just about everyone. Among them is the Hale Koa Hotel on Honolulu’s Waikiki Beach, where room rates start at $87. Since its 1975 opening, it has been “an all-ranks, all-service hotel bent on providing first-class service without regard to an individual’s status,” its Web site says. Army Reserve Capt. Malia Du Mont has stayed at several U.S. military hotels, including Hale Koa, but she had no idea she could do the same in Europe — until she went to Belgium last year to work as an Afghanistan analyst at NATO’s military headquarters outside Brussels. A co-worker was looking at a list of hotels one day, and she and others asked about it. As it turned out, many of the 28 NATO countries make their military hotels available to service members from other NATO states. However, this is not an advertised benefit, and since “there is no centralized Web site or office, not everyone knows about it,” Capt. Du Mont said. “You have to do a bit of legwork,” she added. Being at NATO, it was easy for her to “just walk down the hall” to the liaison office of the country she wanted to visit. She ended up visiting France, Spain and Denmark during her tour. What the French had to offer was most impressive. First, they gave her 10 pages of material featuring several dozen properties to choose from around the country. She picked the St. Augustin Hotel in Paris, which is part of Cercle National des Armes, or National Army Circle. It has a Web site, as do all French military hotels, and you can book a room online if you have a valid military ID. “U.S. military [members] can book a room in any of these hotels, which are not open to the general public,” said Emmanuel Lenain, spokesman of the French Embassy in Washington. Capt. Du Mont, who compared St. Augustin to a four-star hotel, said she paid about $150 a night — at least half of what it would have cost at a regular hotel of that level. A property she stayed at in Barcelona was “not as fancy as Paris but still very nice, with a swimming pool, tennis court, cafe and restaurant, close to the subway,” and cost about $50 a night, she said. In Copenhagen, the place she visited on a Marine base was “more like barracks” — the building was “nice outside, but with very small rooms and no [individual] bathrooms.” The rate was about $56 per night. Typically, various countries’ offices at NATO know very little about military hotels beyond their names and addresses, although in some cases they can make a reservation, Capt. Du Mont said. If you want to know more about the hotel and the amenities it offers before you go there, you have to do your own research. Unlike Capt. Du Mont, who had the convenience of being at NATO, most U.S. service members have no obvious place or people to consult about visiting a hotel in another alliance member state. If you are serving in Europe, your host country’s defense ministry is a good place to start — or perhaps your own base. If you are in the United States, try contacting the embassy of the country you want to visit. Not only do properties vary vastly from city to city, in some NATO members they don’t even exist. In addition, “under the NATO treaty, it is possible to get a NATO tax-free rate at hotels in London if traveling on business,” Mr. O’Reilly said. This entry was posted in Travel and tagged armed forces, Barcelona, Belgium, Brussels, Copenhagen, Denmark, Europe, France, Honolulu, hotels, London, military, NATO, Paris, Spain, Travel, United States, Washington. Bookmark the permalink. Are these rates good for disabled veterans? Great article! 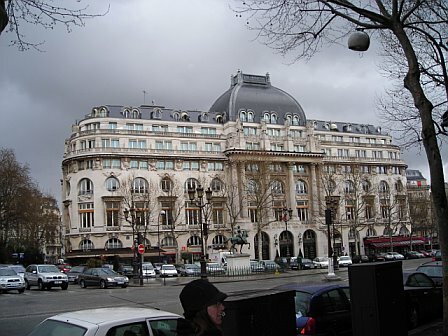 I’m looking to travel abroad on my honeymoon to Europe and am hoping to find other accommodation similar to that of the St. Augustine in Paris. I’m a Sub lieutenant in the Canadian Navy and am hoping to stay in some of these military hotels if you know of any more you could recommend. Thanks!